Posted on 12, February 2016 by EuropaWire PR Editors | This entry was posted in Denmark, Energy, Gas & Oil, Industrial, Management, United Kingdom and tagged David Cook, DONG Energy welcomes, gas production, Michael Smith, the Laggan-Tormore fields, UK’s West of Shetlands area. Bookmark the permalink. Fredericia, Denmark, 12-Feb-2016 — /EuropaWire/ — DONG Energy today welcomed the start-up of gas production from the Laggan-Tormore fields in the UK’s West of Shetlands area. Operated by Total with DONG Energy a 20% equity owner, Laggan-Tormore is located in 600 metres of water West of Shetland and will produce 90,000 barrels of oil equivalent a day (boe/d). The Laggan-Tormore fields are located in the deepwater West of the Shetland region. 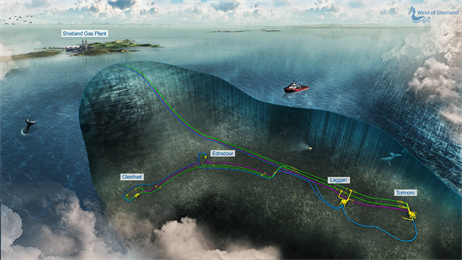 The development consists of a 140 kilometre tie-back of four subsea wells to the new onshore Shetland Gas Plant which has a capacity of 500 million standard cubic feet per day. Following treatment at the gas plant, the processed gas is exported to the mainland. DONG Energy is also a partner in the development of the nearby Edradour and Glenlivet fields, which will tie into Laggan-Tormore’s infrastructure. The Edradour discovery is located 75 kilometres northwest of Shetland in 300 metres of water and the Glenlivet discovery is located north of Edradour in 400 metres of water. Edradour is expected to start up in 2017, followed by Glenlivet in 2018. DONG Energy Oil & Gas holds a 20% interest in Laggan-Tormore, Edradour and Glenlivet along with operator Total (60%) and SSE E&P UK Limited (20%). DONG Energy’s gas fields West of Shetland.